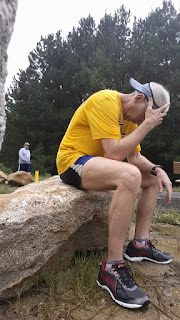 runjoey: Where is the sun anyway? Or training in the dark, rain and humidity. Where is the sun anyway? Or training in the dark, rain and humidity. Considering the nasty weather I have actually had a pretty good week of training again. Everyday had at least some rain and the first of the week some unseasonably warm temperatures. Monday Tuesday and Wednesday were just miserable with the high humidity, warm temps and the dewpoint matching the temperature. Just some easy miles at home on Monday and Wednesday. I made my way out to Umstead to get in some hills on Tuesday. Just horrid conditions but I was running a decent pace. 5 miles in a deluge fell for the next 15 minutes and the trail was a flowing river almost immediately due to everything being saturated. I really struggled up the last uphill mile. I decided right then that Thursday would be a rest day. I was feeling worn down, legs were dead and I wanted to be fresh for Fun Friday am. Yes, Fun Friday. 6:30 start in the dark again and the temperature was great at 54F but not so great was the wind and pouring rain ! No worries, there was work to be done and fun to be had ! 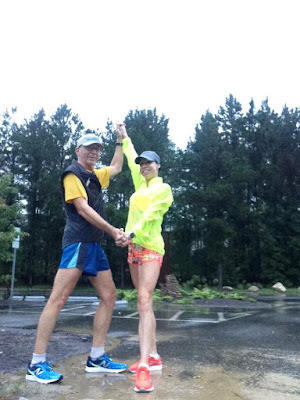 Laura and I did a slow (for her) warm up mile in 8:29. Then the plan was for a descending run from 8:00 down to 7:30. Well, another fail. Got off to a fast start. Hard to judge in the dark and the rain you know and even after backing off the 2nd mile was 7:41. So why not just keep it rolling from there? Next one including the turn was 7:36 and then 7:31. Since we were faster than planned she tells me I can just jog it in if I want to. And I was feeling like that was a good idea but I always try to give 100% plus when I get these chances to run with her so I just kept it going. I think it made her happy ! The whole time she is keeping up the encouragement and little tips to squeeze out as much speed as possible out of me. I was trying to make it last one fast one but with a headwind up over the 3 rolling hills in that mile I just missed with a 7:33. Awesome workout as she always brings out the best in me. Saturday I got in more muggy miles and then finished up with 14 on Sunday am. It was off the charts muggy again. 100% humidity, 63F with 63F dew point. Just took it easy for the 1st 10 and then picked it up finishing with the last mile in 8:03, about 8 seconds faster then marathon pr pace. So, finished up with 43 miles, some good workouts and looking forward to some much improved weather in the coming week. Stay tuned !